From the beautiful snow covered mountains to the magnificent waters of the Angel Falls in Brazil, every destination is more breathtaking than the next. At least Point Break is visually stunning if nothing else. In 1991, a movie called Point Break hit theaters and starred Keanu Reeves (The Matrix), Patrick Swayze (Dirty Dancing) and Gary Busey (Lethal Weapon). It was a surfer's/stoner's dream and has a cult-like following. In 2015, someone at Warner Brothers Entertainment thought it would be a good idea to remake the film but using all extreme sports instead of just surfing. Starring Luke Bracey (The November Man) and Edgar Ramirez (Deliver Us From Evil), it no longer follows criminals hiding behind dead presidents' masks, but instead, chronicles the journey of a group of people who are 1) looking to right some of the wrongs in the world and 2) are on the emotional, and life affirming, path known as the "Ozaki 8". I know… What???? There are so many things wrong with this film; it's difficult to know where to begin. First, it never needed to be remade, but if they were going to, they needed to get a better script. There is nothing memorable in anything any of the characters say. Second, the acting is horrible. I have liked Luke Bracey in some of his other films, but he was just boring; delivering his lines as if he knows the movie awful and is just there to collect a paycheck. Ramirez is so monotone and devoid of emotion that it's hard to imagine him being passionate about anything. Third, the special effects are sorely lacking and it is obvious this film was made on a tight budget. Again, if they were going to remake a beloved film they needed to do it the right way or not at all. Sadly, they ruined some of the extreme adventures with shoddy graphics, making some scenes unintentionally laughable. The one bright spot in the whole film is the various locations. From the beautiful snow covered mountains to the magnificent waters of the Angel Falls in Brazil, every destination is more breathtaking than the next. At least the film is visually stunning if nothing else. The Blu-ray doesn't offer much in the way of extras and the few there are uninteresting for the most part. They try to play off one grouping of featurettes as a look at each of the extreme sports showcased in the film, but really they are nothing more than a series of trailers. The 1080p high definition video is a blessing, and a curse, as it showcases the spectacular scenery, but also shows all the crappy special effects in sharp detail. The DTS-HD Master audio 7 is lost on the terrible sound editing. The vocals are too soft, but the sound effects and soundtrack are so loud they drown everything else out. I had to sit with my remote in hand the entire time adjusting the volume, depending on what was happening on screen. The "remake" should have never been approved. It was boring, far fetched, and poorly made and, unless you eat, sleep and breathe extreme sports, not worth two hours of your time. Skip this one all together and go rent the original 1991 version instead. 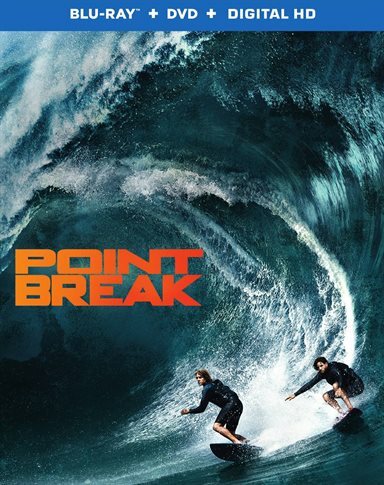 Download Point Break from the iTunes Store in Digial HD. For more information about Point Break visit the FlickDirect Movie Database.